Referee Alan Tressnor of Placerville watches carefully to make sure that Derek Costa, left, of Sacramento, keeps his arm on the mat as he pins Nick Roberts, right, of Orangevale. Costa won the match. Wearing the white shirt in the background is World Famous Barber Jon’s owner, Jon Rivera, who hosted the arm wrestling competition to raise funds for two local non-profit veteran organizations. Photo by Laurie Edwards. With approximately 400 people in attendance throughout the event, the second arm wrestling competition fundraiser was a success in El Dorado Hills. 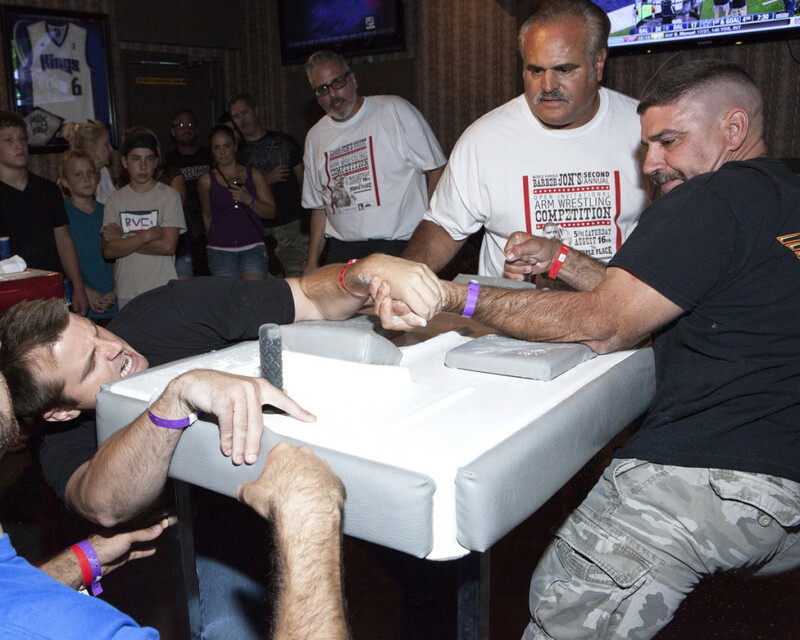 World Famous Barber Jon’s owner, Jon Rivera, hosted his second arm wrestling competition fundraiser to support two local non-profit veterans’ organizations. World Famous Barber Jon’s Open Invitational Arm Wrestling Competition Fundraiser was Saturday, Aug. 16, at The Purple Place, 363 Green Valley Road, El Dorado Hills.